We too frequently fall into the trap of dividing the world into simplistic, either/or categories. Things are either good or bad. Ideas are either liberal or conservative. Forget about purple; states are either red or blue, right? Don’t imagine that the same person could be simultaneously progressive, liberal or conservative depending on the particular concern under consideration. Don’t imagine that a deeper analysis of an issue might expose degrees of political belief, or of good and bad. A world of absolutes is just so much easier – so much more convenient. What makes people interesting, are their contradictions. We all know people who are both introverts and extroverts, or both humble and egotistical. There is a long list of personal traits that bear out the fact that we live along multiple continuums of belief and behavior. Why then can we not seem to recognize this reality when it comes to questions around ideology and values? The roots of either/or perspectives might lie in zero-sum thinking, meaning that you believe that one side wins only if the other side loses. It is a narrow framework that despises constructive dialogue, and compromise. This distorted winner-take-all perspective leads to fear-driven decisions. It breeds fear, xenophobia, racism, and a boatload of other paranoia. Emotion and rumor trump logic and evidence. People build walls and draw lines in the sand. We can get past the either/or trap by concentrating just a little effort on our communication skills. 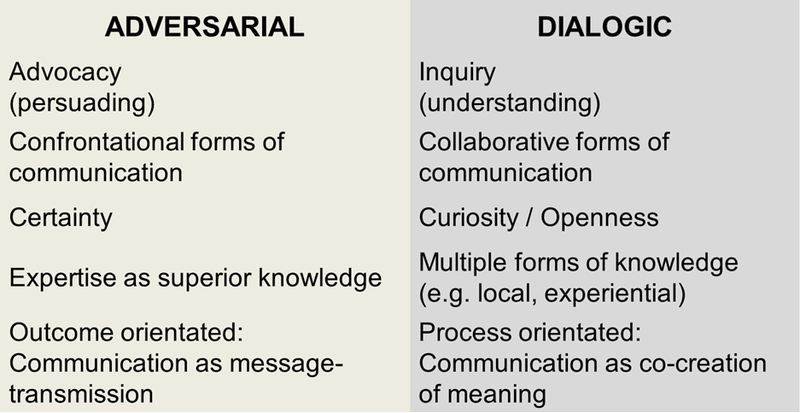 Consider the shift from adversarial, to dialogic communication outlined in the table below. Find a safe space for private, one-on-one conversations with people whose positions on issues differ from your own. Do not enter these conversations as if they are contests. Listen carefully and avoid constructing your own argument in your head while they are talking. Focus on sharing ideas and creating new ones informed by your common, as well as your competing values.